I fell in love with the Escarole & White Bean Soup, a recipe of her friend, Gloria’s Grandmother’s Soup. I tinkered a bit and posted it, then began to tinker more. Honestly, I was looking for a bit more depth of flavor and didn’t mind a little more chopping. So if you’ve tried this recipe before, please take another look. Escarole is a green not always available in my area, and when it is, it’s expensive. Kale, though, another sturdy green is a great substitute. A few changes, like a good stock and dried beans also fabulously frugalize this simple soup, while other changes add more flavor. The trick with Kale is to use it fresh! It should be bright and colorful and crisp – if it’s a dull green, it’s on its way out – it reduces quickly in size and the taste becomes bitter. Watch the color, too, as the soup cooks. I give the rest of the soup a head start and add the kale in last so it retains it’s freshness, keeping in mind as the soup is done, the kale will continue to steam a bit. I like to serve this with Parmesan Toast, an old family favorite. To wash kale: Fill a large basin with water, and add kale and swish; drain and rinse well. Roughly chop. If using dried beans, soak overnight, drain and simmer in five to six cups of water for about 40 to 45 minutes until tender. Drain. Heat about 2 tablespoons of the olive oil to a large pot over medium heat. Add onion, carrot and celery and cook, stirring until softened, five to six minutes. Use a bit of water if vegetables become too dry. Add in the minced garlic and continue to cook for a moment. Add in 2 1/2 cups of the chicken stock. Place the remaining stock and one cup of beans in the blender (reserving the rest of the beans) and blend until pureed. Add the blended beans to the soup along with the squash, oregano and red pepper. Bring to a boil, reduce heat and simmer. Simmer for about 10 minutes, then add kale. Continue simmering until squash is nearly tender, about 10 more minutes. Add beans and heat through, taste and adjust seasoning add salt and pepper as desired. While soup cooks, prepare croutons. Rub the top of each slice of bread with the cut ends of the halved garlic clove. Drizzle each toast with a teaspoon of olive oil. Place under broiler for several minutes until the top is lightly browned and crunchy. Place bread in the bottom of the bowl (or serve on the side), ladle the soup over and serve with a few shavings of Parmesan over the top. 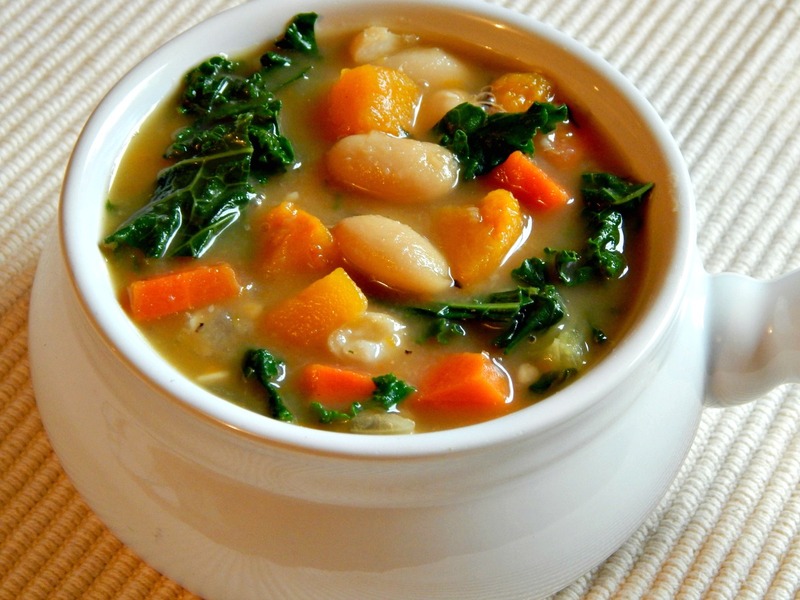 Pass vinegar, red, white or balsamic and olive oil for those who wish to drizzle over the top of the soup. Follow my 12 Strategies – You’ll see them on the upper drop down menu of every page. For soup, not counting bread and cheese which will vary: Calories 406, Cal from fat 183 (remember this is high in fat, but it is olive oil – full of Omega threes – reduce the amount if you’re concerned) tot fat 20g; sat fat 3g; chol 0mg, transfat none; sod 551 (this will be greatly reduced if you make homemade) tot carb 41, fib 11g; sug .55g; prot 15g. You can use escarole like the original recipe stated, or another green of your choice. If you use something less hardy, like spinach, drop it in at the last moment and cook for just a moment or two. Add canned tomatoes with the juice instead of part of the stock, or diced fresh tomatoes. You can flavor this with basil, rosemary and lots of garlic, maybe some balsamic vinegar. If you like a heartier soup, you can saute Italian sausage at the beginning, remove it and continue, then add it back in when it’s time to simmer. If you’re a vegetarian, just use vegetable broth. Recipe made June 2012, reworked and repriced September 2014. This entry was posted in Click here for Bargain Meals, Click here for Fabulous Food Posts and tagged Bargain Meal of the Week, canned beans, Carrots, Dried Beans, Easy Recipe, Frugal Hausfrau, Greens, Kale, Mad Hungry, Soup, Squash. Bookmark the permalink. Thanks for the suggestion – I truly think that Kale wins out as one of the healthiest foods we can eat – for years I’ve seen the top 10 “superfoods” list – and rarely is kale on it, but it should be! I’m always trying Kale different ways, and I’ll try that salad, for sure. Could this be adapted for the crockpot? With two kids under 2 I need all the spare time I can get! Absolutely, it could! The biggest danger, though, is that overcooked greens can become stronger in flavor. Allison – I also double a lot of soups I make and freeze for another meal or in appropriate serving sizes for lunches, etc. – it’s a great way to have something on hand with very little extra work. Most soups freeze well in ziploc bags, although they may separate and leak when you thaw, so you’ll have to thaw in another container and stir them back together – the exception for freezing is soups based on cream or cheese, although you can freeze the vegetable “bases” and add your cheese or cream when you are ready to serve.